Shirataki Noodles are becoming more and more popular because they are basically calorie free, gluten-free and full of a water-soluble fiber called glucomannan. You may have heard of Glucomannan as a weight loss supplement. It is known to reduce appetite, relieve constipation and help manage high cholesterol levels. So with all those benefits, why not eat it as a food. 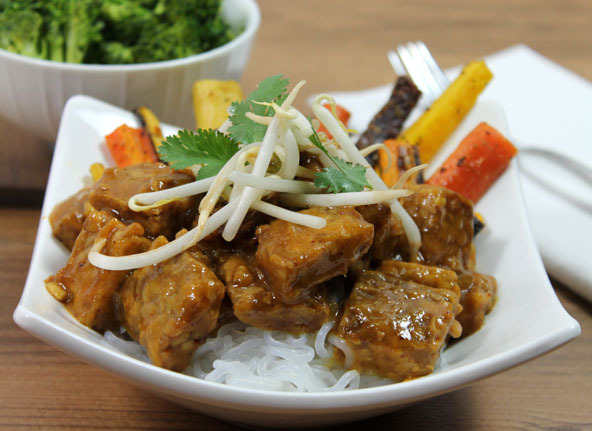 It has virtually no taste and takes on the flavor of the sauce you add to them. 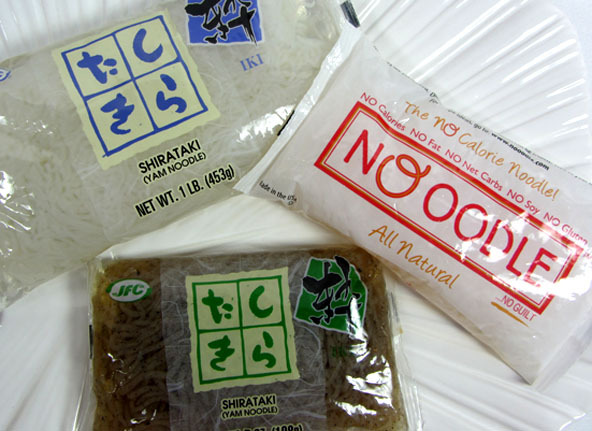 Shirataki Noodles look suspiciously white, as in white and refined but they are actually made from white yams. The name Shirataki means “white waterfall” and they are found packaged with water in the refrigerated section of Asian and Health food markets. I avoid the ones mixed with tofu for various reasons like GMO’s and the processing procedure of tofu. Shirataki is naturally white. The bottom package has seaweed added to it. To prepare Shiratake noodles you simply drain out the water they come in and rinse them off. Next heat them up by putting them in lightly salted boiling water for a few minutes and then draining the water out. That is what I did in the photo above with my Orango-Glazed Tempeh recipe. These noodles are basically calorie-free but are also taste-free. This is why you serve them with yummy flavorful sauces. But I did some experimenting and liked what I came up with in the recipe below. I just added a few ingredients and lightly stir-fried it. This turned these translucent-like noodles into a more pasta-like white noodle with a little bit of flavor. 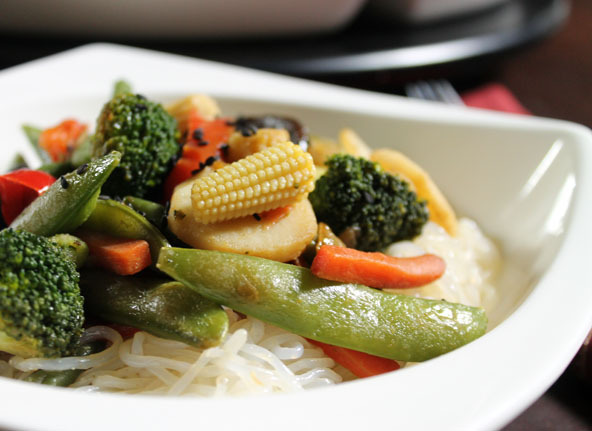 Top with any Asian Dish such as Stir-fry Vegetables. Open the Shiritake noodle package and pour contents into a strainer to drain the liquid out. Rinse with pure water and drain water out again. Place the coconut oil or ghee in a medium saute pan and heat to medium high. Whisk egg and sea salt together with a fork in a medium size mixing bowl. Add the noodles in and mix together with a fork. Place the noodle mixture in the heated saute pan and stir the noodles around while it cooks up sufficiently. This step only takes a minute or two to heat up the noodle while cooking the egg. Don’t even think about using Shiritake noodles in my recipe for “Ramen Burger” Buns however. They are not sticky like grains are so they will not hold together at all. They are actually a slippery noodle. But do use them in soups and stir-frys!